STEVE, a robot built by Knightscope, made headlines in July when it “drowned” in a Washington office complex. 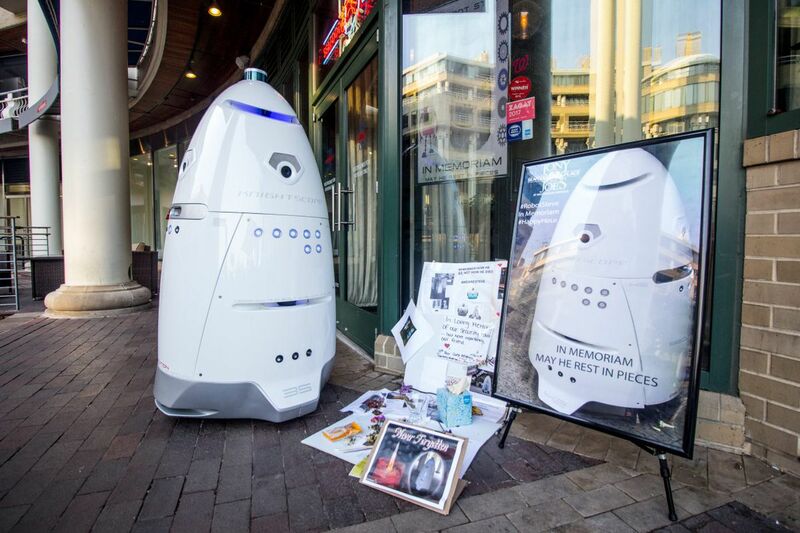 The robot is one of a couple dozen deployed by Allied Universal, the Santa Ana, Calif. and Conshohocken, Pa.-based company that is the largest U.S. security guard firm, with 150,000 human employees. Allied Universal, the largest U.S. security-guard company, employs 150,000 humans — and about two dozen robots. The egg-domed, chin-high robot patrollers "have been well-received" by clients, chief executive Steve Jones told me. "It's a big focus for us. We don't want the industry to innovate without us. We want to be like Netflix. We don't want to be Blockbuster." Formed in a merger last year, the company splits its headquarters between Santa Ana, Calif., and Conshohocken. Backed by private investment firms Wendel of France and Warburg Pincus, Allied Universal has shifted from buying other big guard firms toward plowing more cash into surveillance technologies that can extend the reach of its guards. Enter the robots, built by Knightscope of Mountain View, Calif. They seem to have been deployed with an eye to public relations, to get Americans used to what was, not so long ago, the stuff of science fiction. Reporters at the ABC-TV affiliate in Silicon Valley collected stories about a robot at Stanford Mall in Palo Alto, Calif., getting too close to a toddler and struggling with a drunk. Tech site Verge argued that cyber-mall-cop aggression could break the late science fiction author Isaac Asimov's First Law of Robotics: "A robot may not injure a human being …"
A security robot at the Washington Harbour office and retail complex in the U.S. capital’s Georgetown district fell into the building’s fountain. As they are with pet animals, some people are quick to ascribe human qualities to our electromechanical companions. Boston commuters tried to kiss an Allied Universal-managed robot at that city's Prudential Center, because they found it cute, the Boston Globe reported. And a presumably depressive Allied Universal robot called STEVE was reported by CNN and USA Today to have "drowned itself" in Washington last month after it was found inoperable at the bottom of a decorative fountain at the headquarters of MRP Realty. STEVE was rescued from his "unscheduled submarine trial," rebooted, and returned to duty, its maker later confirmed. Allied Universal said that STEVE stands for Security Technology Enhancement Vehicle, and that it's a coincidence Steve is also the CEO's first name. The robot guard platoon is not building an air force at this time: "No drones yet," Jones told me. They can't yet hold a charge long enough to patrol effectively, he said. And "we don't have any autonomous vehicles." Allied Universal is at pains to say its robots aren't replacing human guards: While they may extend what guards can do, it takes skilled humans to analyze and act on the information. And "you are always going to need people to respond to situations," Jones told me. "A robot or a drone or cameras may help identify an emergency. But if someone is breaking and entering a building, you need a physical presence. We're going to continue to be needing to add thousands of people a year for the foreseeable future." Indeed, hiring "is our biggest challenge," he said. "The labor market continues to tighten. Security-officer wages have always been higher than the minimum. But now you are seeing wages for other jobs increase, and that creates competition for jobs that didn't used to compete with security. It's gotten even harder in the last year." He's worried about the decline in immigration to the United States from other countries. Though Allied Universal hires relatively few immigrants, "if you take away the immigration that fills jobs in other industries, wages [in those industries] rise and suddenly we lose employees to jobs we didn't used to compete with. It creates further tightness in a labor market we think is close to full employment." Jones is less worried about the Service Employees International Union campaign to organize more security guards: "There's a dozen or so union markets around the country where the union has a pretty good foothold. Other markets are non-union. I don't see that changing in the foreseeable future." The company pitches security as a career opportunity, not a dead-end job. "Thousands of employees have moved up in our organization," Jones said, especially those with management experience and technical training. Allied Universal also is advising more companies, hospitals, universities and municipalities on how to move their security technology management "in house." It's hoping the Trump administration's focus on homeland security will make new and lucrative contracts available. Jones said the administration supported a movement to expand the use of national background checks by schools and other employers. A stronger national ID check system would mean "millions of dollars on an annual basis. We would set up another division. But it's got to be efficient, If it's like the DMV and it takes 30 days to get approvals, it compounds the problem, rather than helping." Doesn't growing demand mean that there will be more automation of human security jobs in the future? "Companies are looking at technology services to control their spend," Jones agreed. He expects the rate of change, the balance between people and digital services and analysis, will accelerate as companies learn how to manage their digital helpers.